Winter break started in our part of Norway this weekend. Closed schools for a week. We don´t have a break from work just now, but as Terje´s brother and his family are up in the mountains, at their cabin near Røros, we decided to visit them for the weekend. This winter continues to overflow us with lovely weather and more than enough snow for ski fun activities. Terje´s brother and wife have a charming cabin up in the mountains, near Røros. The last time we went there to visit them it was February, snow covered the ground, ice covered the lake and I spent some time ice fishing. This time it was summer, but a cold, wet one. The rain had a break though, and cold doesn´t matter as long as we wear enough clothes. And with their small boat lying there waiting for us, going fishing was an easy desicion to make.....well, after the youngsters though. but no matter what they were, they tasted yummy. And was it not for the mosquitos, we would still be out there, in the wilderness. A close image of one of the fishes. Terje showing his grand niece how to clean the fish. I am up in the mountains, in the mining town Røros. After a long day of meetings I decided it was full time for a night walk. A night walk in June, the first month of summer. The air felt more like winter though. Fresh snow on the nearby mountains. The leaves on the trees like the tiniest mouse ears. Florists in Norway are stubborn though, and so are the flowers. June is June, and June is SUMMER! Click on the image above to see all my posts from Røros. A weekend in October. A weekend free to do whatever we wanted. Arne and Lisbeth, Terje's brother and his wife, live south west in Norway, at Moi, where my father in law also lives. 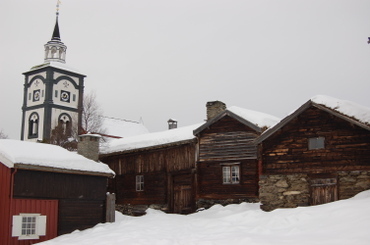 But Lisbeth grew up at Røros, the UNESCO Heritage Site up in the mountains south of Trondheim. 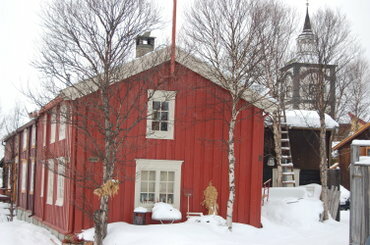 Lisbeth's childhood cabin is still at Røros and several times a year they drive the 12 hours up there. To live the perfect simple life. Marta, Terje and I came up there Friday night, and walked from the car to the cabin under a million stars. Saturday, after a long breakfast, we drove in to Røros for shopping and a visit to one of the multitude of charming cafes. But the weather was lovely, and the colours of the autumn burning. The mountain was calling our names. We packed a huge backpack which we let Arne carry, and started our hike. Marta and dog Winnie in the lead. There are moments in life you can live on for a long time. Mountain hiking moments are among them. We are walking towards winter here in Norway. For the moment autumn is my favorite moment. Will this change when winter comes? I have a new little friend, a weekend friend. He is 7 years old, his name is Winnie and he has the most beautiful eyes you van imagine. Ever since I was a girl and was bitten by the dog of one of my friends, I have been afraid of dogs. But Winnie is an exception. He was wild when he was a puppy, as all puppies are, and made me feel uncomfortable, but as soon as he grew up, he became the most charming dog you can imagine. Winnie charms us all. He loves to play with Marta, and Marta loves to play with Winnie. Winnie does not like could water, but can´t say no to Marta´s games. Winnie loves "uncle" Terje, and "uncle" Terje loves Winnie. Winnie is Marta´s youngest "cousin", the dog of Terje´s brother and sister in law Arne and Lisbeth. We have spent the most lovely autumn weekend with them up in the mountains, at Røros, where Lisbeth grew up and where they have the cabin of Lisbeth´s childhood. but being Winnies "aunt", spending a weekend with him up in the mountains is close to heaven. I am opening a new window. The suitcase is packed and I am ready to climb out, or is it in, to see what is waiting. Four weeks of vacation. Some plans are made, surprises will be added. A new notebook is ready and in it I will add words, phrases, sentences, whole chapters, drawings, paintings, photos. Plates are ready to be filled. Alone and with friends.....mostly with friends. Several of them will hold fish soup. filled with new colourful quilts for my memory chest, my chest of life. And who says that you need sun to have fun.......rain might some days be even better. Today's lesson: find a mirror, or a window, take a good look at the person you see, give her/him a smile and a compliment "hi dear, you look beautiful today", and continue your day. We took yesterday off and took our friends to Røros. More posts to come from this wonderful day. Where to spend a day with Italian friends? Røros of course. After brunch in a sunny Blue Garden (hi, did I forget to take photos......), we headed for Røros, the UNESCO Heritage mining village two hours south of Trondheim. 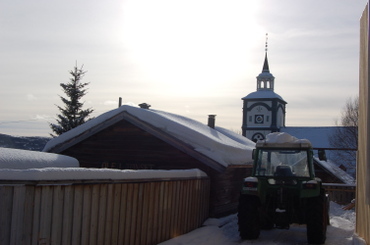 Røros is a place where you easily can get yourself lost.....in charm and beauty. Mauro has bought a new camera for his visit to Norway, and didn't stop taking photos......well, he did stop a few times, but that was when he had problems figuring out how the camera worked, or when he wanted me or Baraba to shoot a photo of him. .....my camera or not, looking through my photos today, the day after, I love those I have of Mauro. Time flies when you are having fun with good friends. After the Røros walk and having lunch there, we drove out to the cabin of Terje's brother and sister in law. There Irene, Mauro's daughter met her paradise, the little dog Winnie. Careful at first it didn't take long to become friends with Winnie, and soon Irene's laughter filled the cabin. Family and friends. Do we take our blessings for granted? Do you really see the people along your paths? Do you meet them with curiosity? With an open mind? 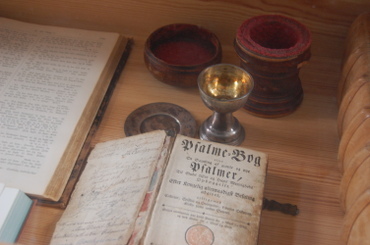 Last photo shows Mauro with a block of copper from the old Røros copper mine. It is a lot heavier than it looks like :-) yes Mauro, you ARE a strong man! 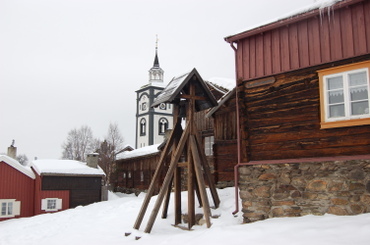 At Røros the old wooden church, Bergstaden Ziir, can be seen wherever you are in the village. 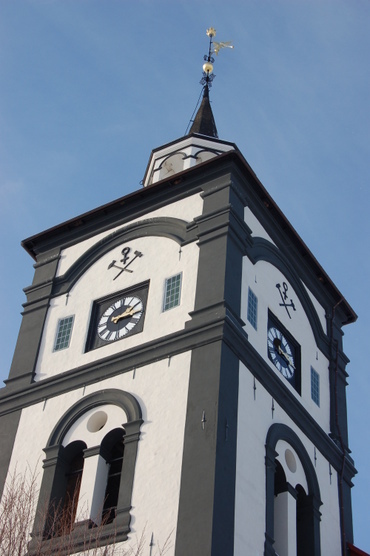 With it's significant black and white structure it has been and is a building popular among artists, and if you want a place for pracers and silence the church is always there. One of the games I play when I am at Røros is to photograph the church from different angels, with different houses in the foreground. How many different church motives am I able to make? Come, enjoy the walk with me. .....and when we are tired of walking we can go inside the church for prayers. My prayers today are for May and her newborn baby girl. May God give you strength through these difficult days. God bless both of you!